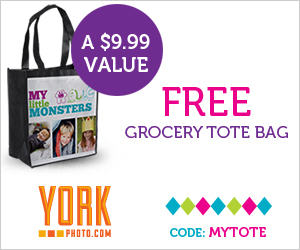 York: FREE Tote Bag! (Just Pay S&H)! New customers can get a *FREE* Tote Bag from York. Make sure you use code: MYTOTE at checkout. You will also get 40 FREE prints just for registering! Shipping and handling charges will apply (around $3.99). York accounts are based upon email addresses. Valid through June 15th, 2013.